There are multiple granite colors and they are different colors and quarried in various places. 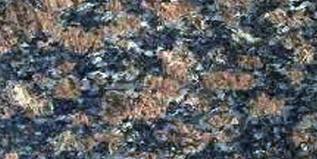 Sapphire Blue Granite is one of most accepted choices in blue variety of granites. India is the originator country of this granite and it is mined in Warangal, Andhra Pradesh of India. There are other names of Sapphire Blue Granite. They are Saphir Blue, Sapphir Blue, and Saphire Blue. The primary color of Sapphire Blue Granite is blue. And there are also brown, black and sky blue flecks on it. Sapphire Blue Granite is has been applied for several years in equally external and internal applications. Because, this granite is fine in texture and has a unique look. This particular granite is excellent for curtain walls, stone cladding, countertops, furniture, elevator panels, water features etc. Blue is the preferred color of about sixty percent of Americans as per ‘Whole Living’ website. This color is classified as a calm and fresh color. So, Sapphire Blue Granite is extensively used as kitchen countertops. White is the finest unbiased color which will brighten up your kitchen with blue counters. In addition to, white goes well with any dark shade. White provides itself to lots of different adorning styles. Creamy-white walls and white cabinets make a traditional look to your kitchen with Sapphire Blue granite countertops. Though black is a standard color which is used extensively in designing the homes, it can be used in the kitchen to bring a modern style. Black shaded kitchen cabinets look modern and rich with Sapphire Blue Granite countertops. If your kitchen is small in size, then it is better to avoid the color combination of black and blue. Because, this combination will make your kitchen looking dark and heavy. Orange is totally opposite the Sapphire Blue Granite shade. Still blue and Orange are common color mishmash in Mediterranean-trend décor. A kitchen which is decorated by these colors would be advanced by terracotta floor tiles, rustic iron furniture and other natural equipments. Similar colors make a gentle harmony. So, if you use blue shaded kitchen cabinets, with Sapphire Blue Granite countertops, it will emphasize your kitchen. Such as, light blue walls and dark blue accents will enhance your kitchen countertops. Sapphire Blue Granite is expensive granite. So, when you install it for any home décor, you should be careful about its proper maintenance. So, seal the granite surface at least once in a year. It will keep your granite enhancing after years.